Hey all, there were a couple Mass Effect 3 profiles on here but none that I liked. I originally played on the Xbox 360 myself and found myself wishing I had a control scheme similar to that. I worked for a while on this profile and it is very close to the 360 layout, or at least as close as I could get. I wasn't familiar with making profiles myself at first but through trial and error and looking through some Mass Effect 2 profiles I liked I was able to come up with this one. Let me know what you guys think. It's almost exactly like the 360 version except you have an extra Quickslot (Quick Slot 4) mapped to the left stick button. I put the Cover Turn on the right stick button. The first 3 quickslots are mapped to Y/LB/RB just like in the game, and each of those buttons can be held down for the command hud (bumpers) or nav assist (Y). The D-Pad is all squad commands just like in the game. You can even Quick Save by holding in the Start Button. I turned up the sensitivity for the right stick quite a bit so that when in-game is at default it feels right to me. Feel free to change the mouse sensitivity in game or in profile to what you need. You should not need to change any of the key bindings in game for this profile to work. The profile is OK, LMB is assigned to LT. Check that binding of this actions in the game is still on LMB. 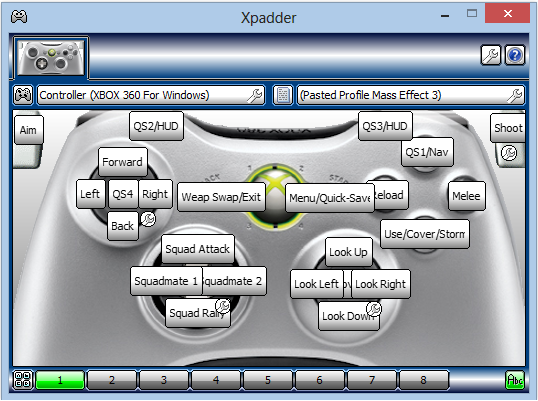 Also open the Xpadder settings by clicking on the button with the tool symbol in the upper right of the main window and make sure that in the Options setting "Use Xinput (if installed)" is checked (the first entry under "Running".